Staff Sgt. 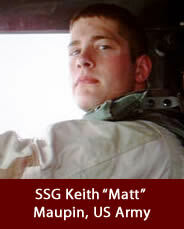 Keith M. Maupin, U.S. Army, age 24, of Batavia, Ohio; assigned to the 724th Transportation Company, Bartonville, Ill.; the armed forces medical examiner confirmed March 29, 2008, that human remains recovered in Iraq were those of Maupin, who had been listed as missing-captured since April 16, 2004. Maupin’s convoy came under attack by individuals using rocket-propelled grenades and small arms fire April 9, 2004.